The Contini Clan: 100 Things About Me! 1. I am happily married. 3. I was first attracted to my husbands eyes. They are dark with long, thick eyelashes. 4. We have 4 beautiful sons. 10. I have been a vegetarian since 1991. 14. I can not dive into water. The water gets up my nose every time. 16. I once passed out while getting my blood drawn. 20. I ran a half-marathon almost 20 yrs ago. 23. I do not like being the center of attention. At all. That aspect of my wedding was difficult for me. 24. I have a tattoo on my back. 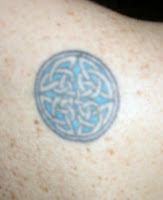 It is the Celtic symbol for spiritual quest. I thought I was being very deep when I chose it. Now I just tell people I don’t know what it means. 25. My belly button is pierced. I also have an earring on the top of my ear lobe and at the tragus. 30. I get pretty cranky when I am hungry or tired. 31. I have spent a total of 34 months pregnant. 36. And my hair turned about 2 shades darker/drabber. I fix that with highlights. 37. I get VERY nervous talking to a group of people. 38. I am very shy in social situations. 40. I am not as patient with my kids as my husband is. 41. I am not a very patient person in general. It drives me nuts when someone is paying with a check at the grocery store. Who does that anymore? 42. I do not wake up happy. I can’t talk until I have my coffee. I have to have coffee every morning. Even before I work out. Even when I was pregnant. 43. My husband knows this and doesn’t even try to talk until I have started drinking my coffee. 46. Despite #42, I consider myself a morning person. I get up at 4:30 am on mornings I work out, 5:30 on other mornings. Sleeping in is 6:30am. 47. I was NOT a morning person before kids. I wasn’t a night person either though. I guess I was a mid day person. 48. I put myself through college waiting tables. 49. I hope to be able to put all 4 of our kids through college so they do not have to work. 50. After owning a digital camera for 6 years, I finally learned how to get the pictures out of the camera and onto the computer. My husband is thrilled. 51. I cry when I hear or read about awful things happening to children. 52. I cried a lot during my pediatric residency. 53. My husband thinks I cry a lot at everything. He is probably right. 54. I love to watch football. I especially like to watch with my husband. 55. I painted almost every room in our current house. It took about a year to complete. I chose fun, bold colors. 58. I am never happy with how my body looks. Currently I would like to lose 5 lbs. 59. I have been afraid of flying since I had kids. It has gotten worse since 9/11. I was such a basket case on our last trip that my husband says I need to start taking xanax before I fly. I think he is right. 60. I hate running late for anything. I get anxious if I am not at an appt at least 5 minutes early. To me, fashionably late is arriving at the scheduled time. 61. I do not like being told what to do. My natural reaction is to do the opposite. This is very juvenile and I am working on it. 63. I skipped 5th grade. 64. I went to 1 middle school. 65. I went to 3 different high schools. 67. I graduated with a degree in Biology from University of California, Irvine. 68. I got my medical degree from University of California, San Francisco. 69. I loved living in San Francisco!! 70. I am a general pediatrician. 71. I love my job, but feel very torn, and at times wish I was a stay at home mom. 73. I love to travel! 76. I am not good about drinking water. 77. I like the taste of amoxicillin. I will lick the medicine dropper after giving it to the kids. I will even drink what is leftover! 78. I love the color pink. I buy a lot of pink clothes (why not? I am the only one in my family who can wear it). 79. Pete has asked me not to buy any more pink clothing. 80. I do not like to dance in front of people. The last time I did was probably at our wedding. 82. I think I have a bad temper. 84. I think I have a good sense of humor (but doesn’t everyone think that about themselves?). But I really do. 85. I consider myself a fairly liberal democrat (see # 69) Go Hillary!! 86. I love Mexican food. I could eat it every day and not get tired of it. 87. I went sky diving 3 times in college and loved it! 88. I would never do it again. I am terrified of dying and leaving my kids without a mom. 89. When I was 18, my dream car was a candy apple red Ferrari. I vowed to have one. I currently drive a 2002 Toyota Sienna mini-van. Now my dream car is a gold/brown 2008 Town & Country mini-van with seats that swivel and a drop down DVD player. A girl can dream! 90. I have really thick hair. As an adult I have grown to appreciate it. As a teen I was annoyed by how long it took to dry! 91. I have been plucking/waxing my eyebrows since I can remember. If I didn’t I would have a uni-brow. 92. Christopher has inherited this uni-brow. Poor kid. 93. I think people think I am more “together” then I really feel. I frequently feel overwhelmed with the ever present list of things to do at home, work and with the kids. I always feel like I should be doing more then I do. 94. I swore I would never work at McDonalds. 95. My first job when I was 16 was at McDonalds. I had a bad sunburn on my face on my first day. I had to work the entire shift at the fish fryer . I wanted to quit. I ended up working there for about 2 years! 97. I am covered in freckles. I hate it. 98. I love my boys. 99. I love my husband. 100. I love my life!! YAY! I had forgotten about some of these things about you and then I learned a few more things about you. All the more reason to love you and be glad we are friends! Thanks for the push to do my 100 too. How fun! Because I know you are a pediatrician I would have *never* guessed you have a tattoo and a piercing in your belly button. You looked so cute pregnant in that picture, like you simply had a strap-on basketball that was tan. Before I had kids I thought people thought I was more together than I really am. Now I'm trying to embrace that "forgetful, unorganized, zany chick" persona that I seem to have morphed into. I also loved that you introduced your husband to a gay friend to get more research! This was fun! My 100 things post was boring. I can't believe you like Amoxicillin. EW. Also, my feet grew a size and a half after my first pregnancy. Thankfully they didn't grow any more with my second. That was a good read! We have quite a few things in common! I cannot BELIEVE you cannot type properly...how can you manage??? I'm having fun catching up on your blog!